With Australia fast approaching, I was thinking about what sorts of iconic Australian foods and recipes I could make healthier and gluten free. In the past we've made a Gluten Free Fairy Bread Cake Recipe, a Gluten Free Homemade Tiny Teddies Recipe, Traditional Aussie Damper, Raw Lamington Chocolates, Raw & Vegan Lamington Truffles, Gluten Free Lamington Cupcakes Recipe (apparently someone had a lamington thing going on that year), a Healthier Gluten Free Buttermilk Scones Recipe, Gluten Free Vegan Chocolate Crackles Recipe, Gluten Free Cheesymite Scrolls Recipe and Healthy ANZAC Biscuits - but this year I wanted to do something different. Instead of sticking to the popular Australian foods, I decided I wanted to play around with something totally different. I got to thinking about the foods I liked as a kid that I either couldn't eat anymore or couldn't get anywhere else - and that's when I realised something! Arnott's Assorted Biscuit mixes are pretty much an Australian classic. They're what Grandma probably uses to fill her biscuit tins, they're found in just about every church pantry around the cupboard and they're probably devoured by thousands of Australians each day with a cup of tea. When I was a kid, I was a little bit choosy when it came to those biscuit mixes. I'd happily pass up every single biscuit; except for one. 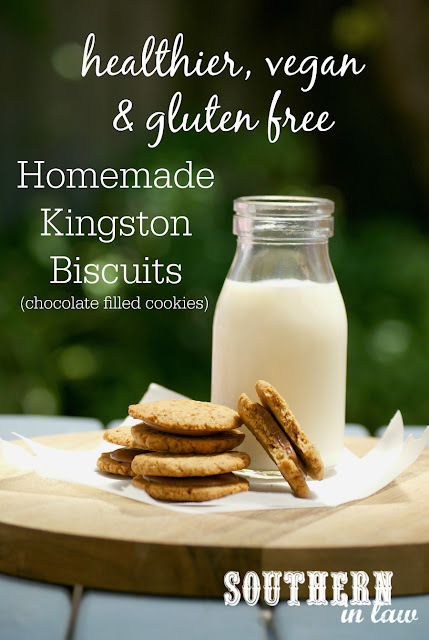 If there happened to be an Arnott's classic assorted packet opened, my little hands were going straight for those Kingston biscuits. 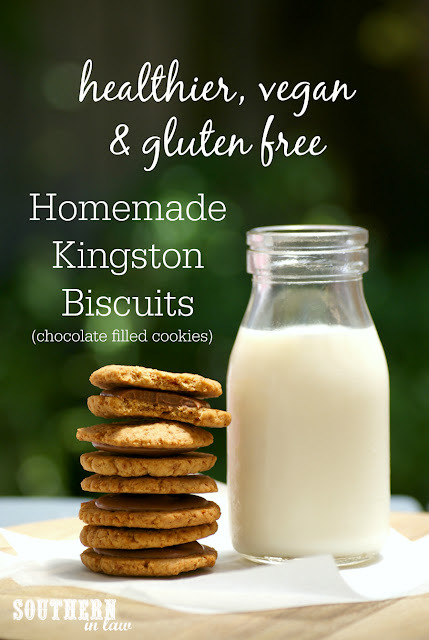 In case you don't know what a Kingston biscuit is, let me explain; it's two crunchy buttery cookies (or biscuit, as Australians call them) sandwiching a milk chocolate filling. If you're eating them in the summer time, chances are that chocolate filling is deliciously melty - or you can pop them in the fridge for that hard chocolate bite (I'm a melty girl). 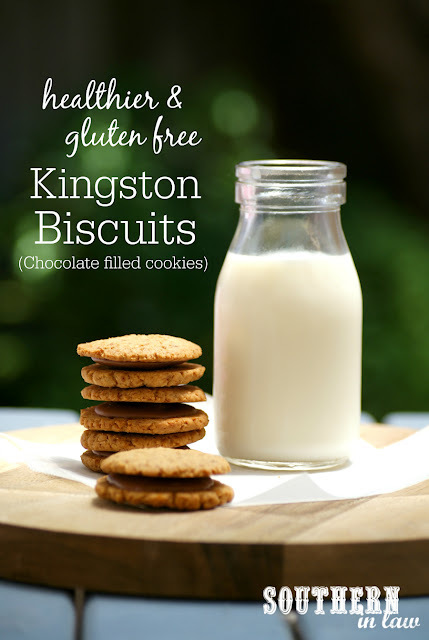 Jesse had never tried a Kingston biscuit, however, he took one bite of these cookies and first complained that everyone else had gotten to the biscuits first and that was the second last one left - and secondly exclaimed that these were THE BEST COOKIES EVERRRRRRRRRRRRRRRRRRRRRRRRRRRRRR. For the filling: ~1/2 cup chocolate chips or chocolate melts, melted (use vegan/dairy free chocolate if needed - the choice of milk or dark chocolate is up to you, however, we used Cadbury Milk Chocolate Melts which are gluten free). Preheat your oven to 180C/355F and line two to three baking sheets with baking paper. In a mixer, cream your butter and sugar until light and fluffy, scraping the sides down inbetween to ensure everything is incorporated. Once your butter is creamed, add in all of your remaining ingredients and mix until just combined. If needed, knead the cookie dough together with your hands to incorporate all ingredients. Once all of your biscuits are shaped, bake them for 8-10 minutes or until golden. If you want them extra crunchy, bake them for up to 12 minutes. Allow your biscuits to cool completely on the tray. Divide your biscuits in half (if making 15 you'll have 30 in total) and spread the melted chocolate on half of your biscuits. 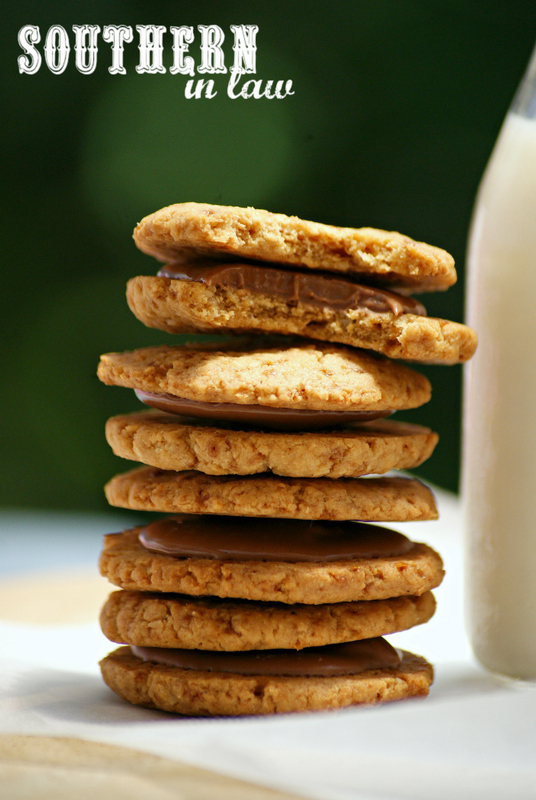 Allow the chocolate to set for a couple of minutes before placing the second biscuit on top (this just stops the chocolate from oozing out everywhere but still allows them to stick together). Enjoy immediately or store in an airtight container at room temperature for up to a week. We find these are best eaten on the first or second day as they do soften up a little, however, the choice is yours! **If you only have shredded coconut or coconut flakes, simply run it through your food processor or blender to create a finer texture. This will give you the best end result! But tell me, what's one food that reminds you of your childhood? And what's one not-so-traditional/known food you associate with home?